***Update*** Folks, we have made some amazing progress in the building. Phase one is almost complete and we will soon be ready for the restoration phase to begin! We are attempting to raise the funds for the roof restoration through GoFundMe. 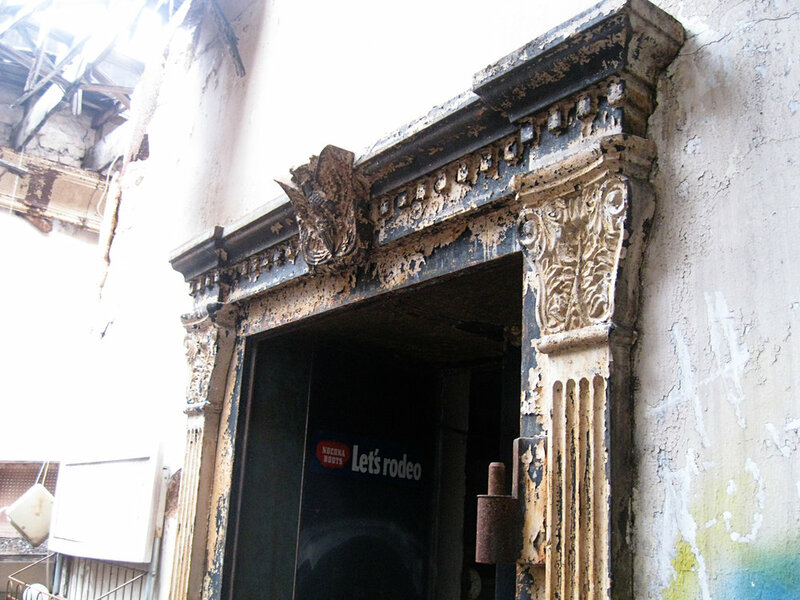 We’ve had so many people contact us, wanting to help out and see this building restored. 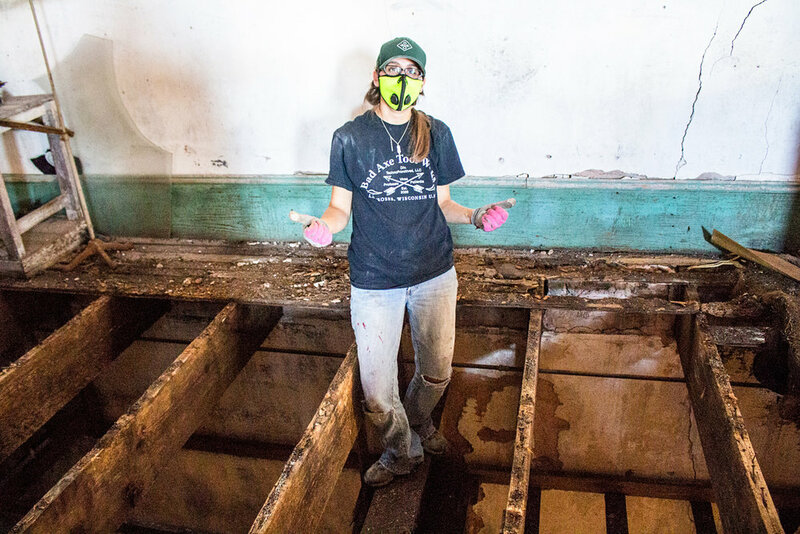 The best way to help out at this point is to assist with getting those roof repairs complete! Donating to our campaign is the fastest way to accomplish this. You can visit our campaign here, gofundme.com/benchoff-building. Please share this link as well with your friends and family! Every single donation makes a huge difference for our family business, for this beautiful building, and for the community of Menard, Texas. If you’d like to learn a little more about our building and its history in this small, West Texas town, just continue to read below! Folks, we are elated to introduce you to the Benchoff Building, future home of Texas Heritage Woodworks! We have been investigating ways to expand our business lately with the ultimate goal of hiring employees and manufacturing our products on a larger scale. Our challenge has been finding the right place, at the right price, in the right location, and with the right aesthetic. That's a pretty tall order in our small Texas town. We know for certain that we aren't leaving this area, our sons are the seventh straight generation raised in Menard County. We love this area and don't plan on leaving, so our search area was very limited. Through several counts of sheer happenstance, the Benchoff Building in Menard, Texas became available for acquisition right when our need for a larger location had peaked. For the first time since 1919, this beautiful Limestone structure has been available for purchase. After nine long months of pursuing this location as our new headquarters, the deal is finally done and we have the keys! We have a magnificent amount of work ahead of us before we can move into this building. It's what you might call a "Fixer Upper". We have lofty aspirations, a solid business plan, and a strong work ethic. We are looking forward to restoring this beauty back to its former glory, and we are going to document the entire process here. It should be quite the undertaking, we hope you enjoy following along! Before we delve into the details surrounding the building and our plans for it, we have to acknowledge and thank those that have supported us over the last few years. First and foremost, Sarah and I would like to thank our parents Buddy and Jan Wilkinson of Menard, Texas and Warren and Melanie Thigpen of Pipe Creek, Texas. Without their unconditional support and assistance, none of this would have been possible. They provided us with free child care when Sarah and I attended woodworking events across the country or when we had a deadline looming and needed all the child-free time we could muster. They have provided countless hours of labor helping set up our shop space and home when we moved to Menard, providing help to this very day. Two young parents of three rambunctious boys could never have pulled this off without the love, labor, and emotional support of our parents. Thank you, from the bottom of our hearts. Thanks to the diligent record keeping and preservation efforts of the community of Menard, a lot of this building's history has been preserved, most notably in "Menard County History - An Anthology" published by the Menard County Historical Society in 1982. The following are excerpts from this book that cover the basic timeline of the Benchoff Building, built in 1900, right after the Great Flood of Menard in June of 1899. D.G. Benchoff Dry Goods and Groceries, circa 1906. "Construction of the Benchoff two-story stone building (now occupied by Wilensky's) was completed in 1900. The "D.G. Benchoff General Store" was actively conducted on the first floor of the building. They handled a general line of dry goods, hardware and other supplies and Mrs. Benchoff operated a line of fine millinery goods. The rear portion of the upper story , consisting of several large rooms, was furnished and maintained by the popular "Men's Business Club." 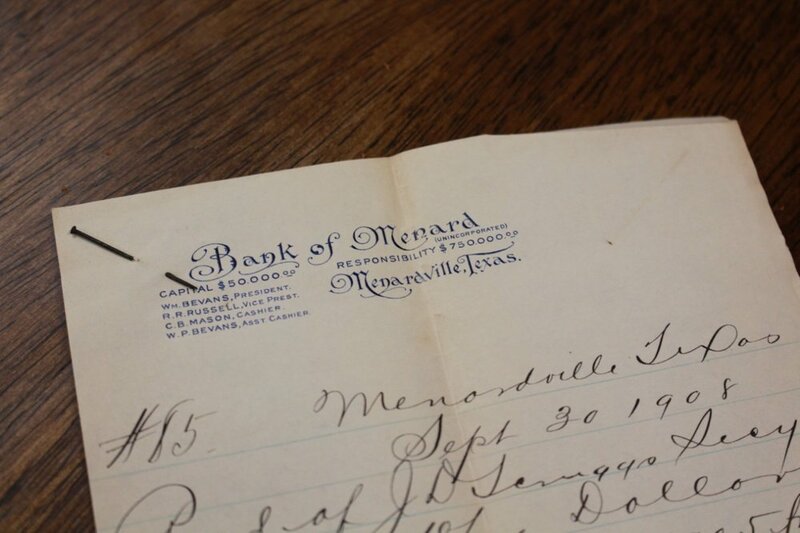 Many of the leading businessmen and ranchers of Menard County regularly participated in this social and civic organization. There were also apartments and many railroad men stayed there during the days of the first railroad terminal. Mr. Bell (a close family friend and former Texas Ranger) stayed for almost 30 years. He was a "drummer" (traveling salesman) and sold goods from a wagon in the outlying areas of Menard. The upstairs front of the building was a large auditorium and dance hall. "Benchoff Hall" was the scene of numerous, festive occasions into the early 1930's, including school graduation programs, vaudeville shows and grand dances which attracted guests from throughout Menard and neighboring counties. The most important occasions were attended in formal dress: top hat, tie, tails and long gowns. Many of the great dance bands of that day performed in "Benchoff Hall." "The Benchoff's mercantile business and other enterprises survived the nearly disastrous drought and economic decline of 1917-1918 but their marriage did not. in 1919, David Benchoff returned to his general store operations in Eden, opened another in Nugent, Taylor County, Texas and married Nanny Hobdy in 1919." "Mary Benchoff lived in Menard devoting much of her time to millinery work. After the sale of the Benchoff store to the Wilensky Brothers in 1919, she continued to operate a millinery store in Menard until 1926." "In 1912, Uncle Ike (Wilensky) started peddling in the Menard area in then and finally moved here in 1913 with his brother Rubin. Rubin and Ike opened a small grocery store in 1913, but sold out in 1916 and left Menard, In 1917, Uncle Ike came back and bought the Benchoff Dry Goods and Grocery Store business. About a year later, he sold the Grocery Store part of the business to Abe Levinson and Harry Polunsky. During the early years in Menard, Uncle Ike lived in the old Rock Hotel and the Sieker's Hotel until he married Josie Block of Dallas in 1920. Aunt Josie and Uncle Ike never had any children of their own but both of them were very fond of kids. Uncle Ike gave nickles to almost every child that came into the store. He saw them as future customers which has proven true since we have had third and fourth generations of the same family trading with us." "In 1923, Jake Wilensky, Ike's nephew, moved to Menard and worked in the store. Jake stayed until 1925, when his father, Rubin, died of the flu. After this, Jake moved back to Brady to run the family store there. In 1935, Jake married Anna Bess Meyers in Mineral Wells. 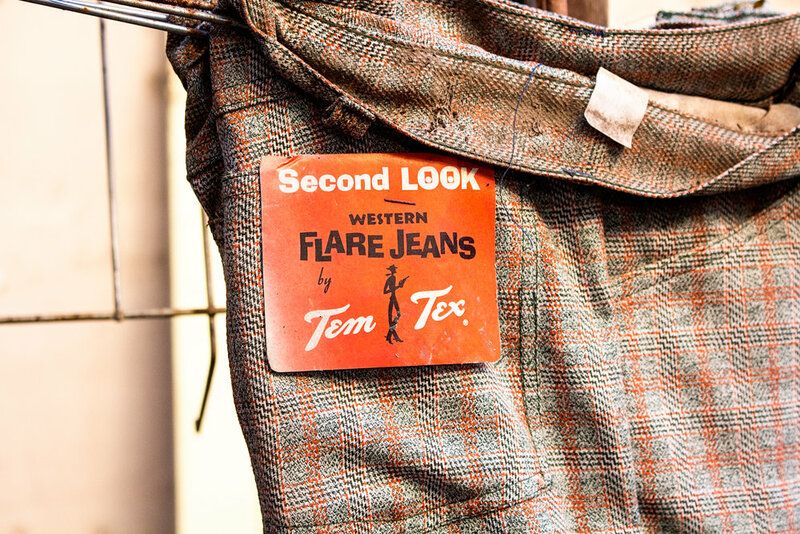 In the spring of 1936, they moved to Menard and started working in the dry goods store. Everything went well for the Wilensky's through these years. The war in 1941 improved business and that took up most of everyone's time. The store would open from 7:00 a.m. to 8 p.m. five days a week and 7:00 to 10:00 on Saturdays. There were as many as nine employees working steady in the store during those years. Aunt Josie died in 1945. She was followed in death by Uncle Ike on Feb. 29, 1960. Both are buried in San Antonio, Texas. Jake and Anna Bess took over operation of the store after Uncle Ike's death. Jake and Anna Bess have two children, Ralph, who was born in 1940, followed by Marilyn in 1947. Years passed without much incidence until 1974 when Jake and Anna Bess sold the business to their son Ralph and his wife Patsy. Ralph and Patsy have two sons, Rocky and Zane, and one daughter, Robin." 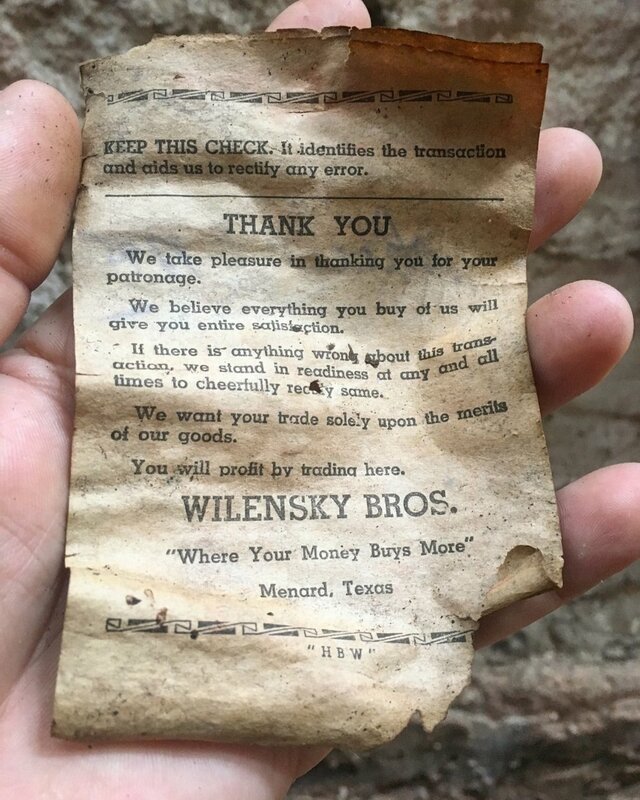 Ralph Wilensky closed the doors of the Wilensky Brothers building for good in the early 1980's, leaving decades worth of General Store merchandise, equipment, and everything else inside. 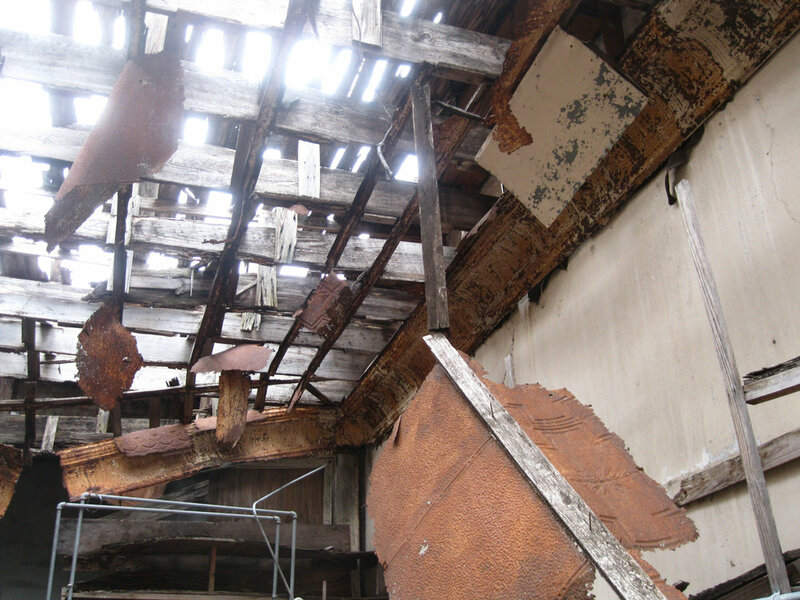 The building has remained unoccupied since then, slowly falling into disrepair, culminating with a partial roof collapse sometime after 2012. Ralph Wilensky passed away on November 16, 2016. We just acquired this building through his estate. 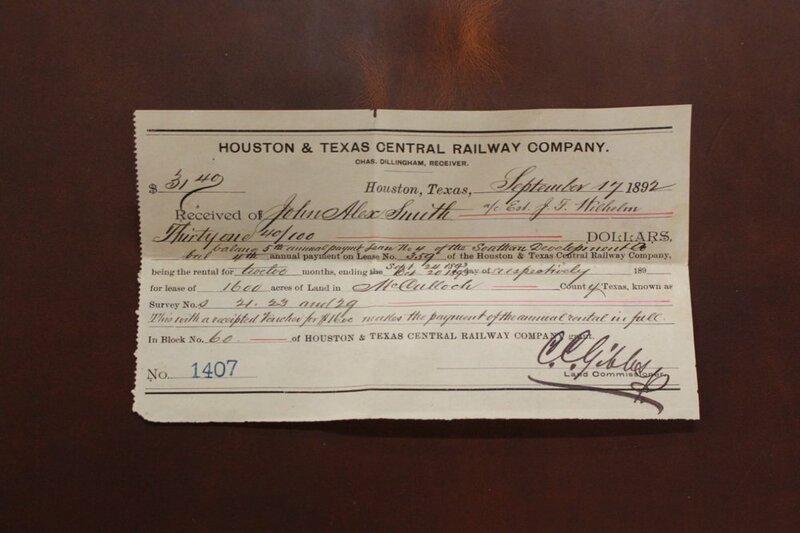 117 years after it was built, we are the official third owners of the D.B. Benchoff building! This building provides us with a lot of space, close to 8,000 square feet is under its leaky roof. With that much space, we have a lot of options available in terms of how to use it. Obviously increasing the production capabilities of our business is a top priority. The entire second floor will be dedicated to the manufacture of our existing product line, plus dozens of other items that I've got bouncing around in my head right now. We plan to have the walls lined with industrial sewing machines, riveting stations, woodworking benches, and leather working benches. A large cutting table in the center of the floor will allow us to cut thick leather hides and layers of heavy waxed canvas with ease, instead of kneeling on my concrete shop floor like I do now. To handle the increased production that the larger space will allow, we will need to hire employees. I could care less about college degrees and polished resumes. Give me a handful of people who are good with their hands and have a strong work ethic. It would be a fun and productive workplace, filled with vintage equipment and quality materials. With the increase in work force and larger work space, we will be able to release more products than we currently offer. We will be able to produce larger quantities of the items we offer now, with zero compromise in quality of materials or workmanship. I dream of a day when we actually have things in stock, instead of the 8-10 week turnaround times we currently have. More space and more people is what we lacked to get that done. The second floor will be our priority once we are ready to move in. Once the manufacturing side of things is taken care of, we can then focus on the rest of the building. So what do we have planned for the rest?? With our manufacturing needs taken care of upstairs and the business running like a well oiled machine, what could we use the lower half of the building for? Education and the promotion of craftsmanship, that's what. A lot of the first floor space will be dedicated classroom space. We will offer classes in a multitude of disciplines with instructors brought in from all over the world. Courses ranging from woodworking to blacksmithing to leatherworking to basket weaving, and everything in between would be offered. Classes could be as simple as a one-day introductory course up to a six day class involving much larger projects. Our focus would be on traditional skills and methods, primarily involving hand tool use. We would love to offer after school programs for the local youth, teaching beginning woodworking and leatherworking skills. Learning a skill or trade as a youngster can be a valuable and rewarding experience. It builds their self confidence and gives them access to skill sets that they can make a living with. What better way to invest in our community than through our youth? In addition to the classroom space on the first floor, we will also have a General Store occupying the original storefront of the building. It'll need to be restored back to its original condition, it currently has a 1960's era department store vibe going on, including a fancy neon sign outside. Our General Store will not only be stocked with the items that we make, but also with a carefully curated collection of handmade wares and goods. We will partner with talented and innovative makers and artisans to bring you handmade furniture and jewelry, handcarved bowls and spoons, hand woven rugs, custom felt hats, ceramics and more. On social media we are big proponents of our online community. We support each other and inspire each other, lift people up when they are down, celebrate in each other's successes, and just generally treat each other right. We support small businesses and mom and pop shops because we see the time and effort they put into running an honest business. We support the small boutique tool makers because we see the passion and detail they put into each piece they make. The story sometimes can be just as important as the product. This General Store and Classroom will be a physical embodiment of this online community. We hope to bring makers, artisans, and unique individuals together in our beautiful community and provide an experience like no other. This building has so much potential. Let's get started!! Clean this mess up!!! Phase One involves cleaning the place up so that we can get an accurate assessment of everything that's needed. There's no sugar coating it, this place is a mess. With exposure to the elements due to the roof issues and missing windows, the interior of this building is pretty rough. Anything along the walls has been exposed to moisture, some things more heavily than others. We are pretty much faced with removing everything in sight, with the end goal of having four solid walls and a blank slate. At initial glance, it seems most of the floor on the second level can be saved. The I beams that support the second floor, as well as the main floor joists that run the length of the building are in good condition. The flooring along the walls has rotted and needs replacing, but it looks like the center can be reused. We won't know for sure though until we can empty the second floor of its contents and get a good look at the wood. Some parts of that floor haven't had a set of eyes on it in a century, I bet. The roof is the big issue. At this point it can be repaired, instead of fully replaced. This is great news for us! Here are some photos from a few of our first visits to the property.